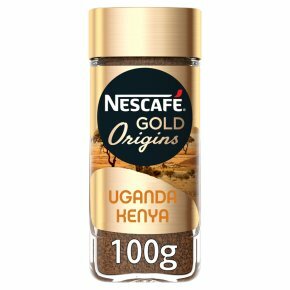 Experience NESCAFÉ GOLD ORIGINS Uganda-Kenya premium instant coffee. A premium medium roast instant coffee with balanced flavour. Crafted with Arabica & Robusta coffee beans from Kenya & Uganda. Savour a balanced blend of fruity, spicy overtones & mild earthy notes. Grown respectfully; sustainably sourced & selected by local farmers.Sit back, relax and experience the balanced depth of flavour in NESCAFÉ GOLD ORIGINS Uganda-Kenya. This premium instant coffee is crafted from an expert blend of Arabica coffee beans from Kenya and Robusta beans from Uganda, to create a balanced cup of coffee that delights the senses.